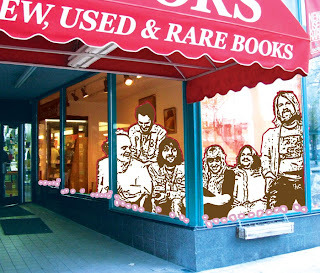 Let's hope the window glass holds up..
As part of our 3rd Annual Holiday Reading Window and the Downtown Holiday Stroll, Sam Weller's presents a special, free, in-the-window show with the Band of Annuals! On Friday, December 5th at 7pm, Band of Annuals will perform inside our front window display, with a party ensuing in the streets, doorway, and in the bookstore. Beverages and festive goodies will be provided. It should be a riot (but not literally) . .
Cet événement a été incroyable! We rounded out our week of globe-trotting events on an incredible, inspiring and adventurous note with a presentation by Alexandre Poussin. He and his wife walked on foot the entire length of Africa, from the Cape of Good Hope, ending all the way at the Sea of Galilee in three years. In the end, they found they had discovered as much about the lives and stories of modern-day Africa, and about each other, as humankind’s ancient ancestors. Their documentary series, Africa Trek, is currently airing on KUED sundays at 5pm. 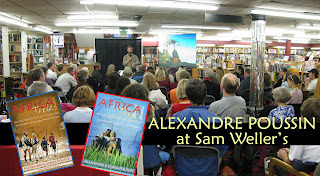 Their books, Africa Trek volumes 1 and 2 are available here at Weller's. All who attended were charmed and impressed with Alexandre, truly an amazing human being. See more pics of the event here. Sam Weller's has a crush on Sabiha! 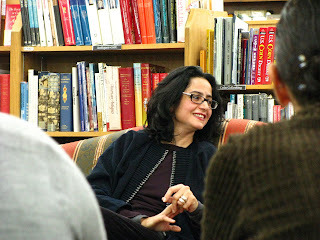 Last night Weller's was fortunate to be graced by the presence of the lovely author, illustrator, and Islamic art historian Sabiha Al Khemir. She enchanted all guests and staff with her stories and mystical perspective -many wished she could have read out loud the entirety of her new novel, The Blue Manuscript. More pictures of the event Here. So I've worked here at Sam Weller's for about 7.5 years. And that's nothing compared to some of our sage and wisened employees (I won't name names here, but we'll count some of them in the 30+ years mark). 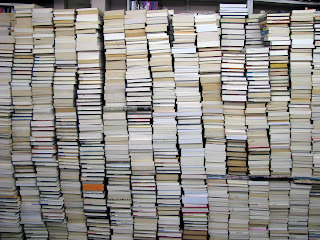 I feel so fortunate to be around the plethora of information and aesthetic beauty in which the world of book-selling is seeped.. As a sculptor m'self, I'm constantly inspired by my surroundings: like the beauty of a mass of stacked bound and printed matter, otherwise known as yet another temporal manifestation of our great wall of books. Count me in as a member of the cult of the object of the book, and I suppose what must be the cult of booksellers. Sam Weller's Bookstore and Red Butte Garden's have teamed up for a couple of seasons to present the always delightful Em's Sprouthouse Storybook Hour. This month we will be reading Thea's Tree by Alison Jackson. This is a great book for the future naturalist, scientist, and scholar! Thea Teawinkle, is the star of our story, and tries desperately, through a series of letter's to identify the budding vine in her backyard. Each day it grows, she writes a letter to yet another scholar to make an identity. She receives letters from a full range of specialists including a botanist, arborist, museum curator, zoologist, and tree remover. There is a familiar fairy tale underlying Thea's Tree, and the author does a pretty good job of masking it until the end of the story, when things like say...a singing harp start falling out of the sky! Join Sam Weller's this Saturday, November 8th from 1-2 in Em's Sprouthouse at Red Butte Garden for a reading of Thea's Tree followed by storybook-themed activities. Appropriate for children ages 3-6. Must be accompanied by a caregiver. Red Butte Gardens is located on 300 Wakara Way, SLC, UT 84108. Regular Garden Admission - Members Free.